Another 4:30 am start. I found getting up early again OK. Bikes reloaded, breakfast and then we are off on the road for the planned 6 am. 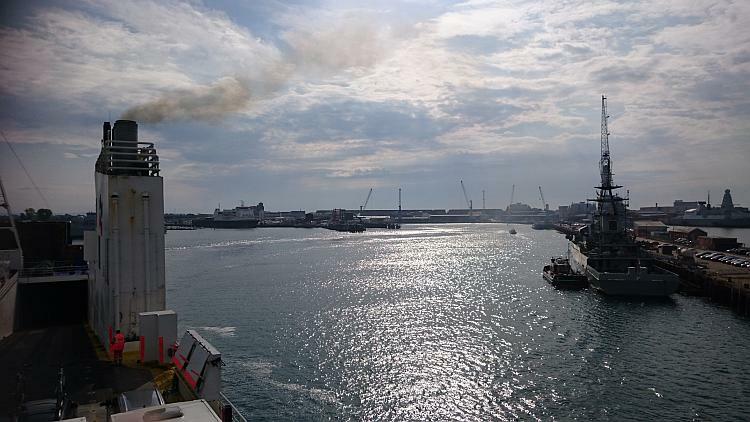 I begin to feel the nerves kick in as we ride to the port at Portsmouth. Not the terrified nerves of my first ferry and trip abroad, more an excited but anxious flutter in my tummy. Following signs from Ferring where Ren's dad lives to Portsmouth is fairly straight forward. We arrive at the ferry terminal in good time and proceed through passport control to security. Having the tank bag is fabulous for my passport and various other items. I was never a fan of them until recently. However I knew I would need one for convenience's sake while travelling. Ren bought me one and I have to say it is a fantastic present. Thank you Ren. Security are friendly but ask me to open my luggage. Open my luggage? Arghhhh! He does not realise how tightly and with the utmost precision each item is packed within my luggage. If I pop it open now he may find himself buried beneath an avalanche of knickers, socks and inflatables. Now then calm yourselves down at the back we talking sleeping mats here only. I hopefully ask how many I have to open - one? Errm, no all of them is his reply. YIKES!! I gingerly pop one of the bags open carefully. So far so good the contents remain inside. Once glanced over by security I quietly and with extreme gentleness close it again. One false move and the beast within may awaken and the resulting eruption may well register on the richter scale. I think someone is excited about his ferry ride. It is only a short wait until we are told to board. We've had time for a quick chat with other bikers behind ourselves. They are on a array of bikes and I get the chance to sit on a lowered Triumph Bonnerville. Wow super low even lower than my own bike. 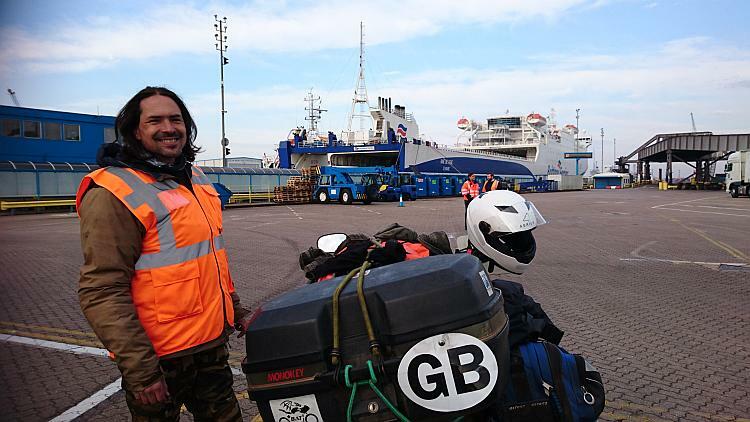 Back on my own bike it is time to ride onto the ferry. Up the wide concrete ramp with surprising ease and into the loading deck. A sharp left turn on a wet deck is required to get the bike lined up where directed which causes a tiny moment of flutters but other than that it is amazingly simple. 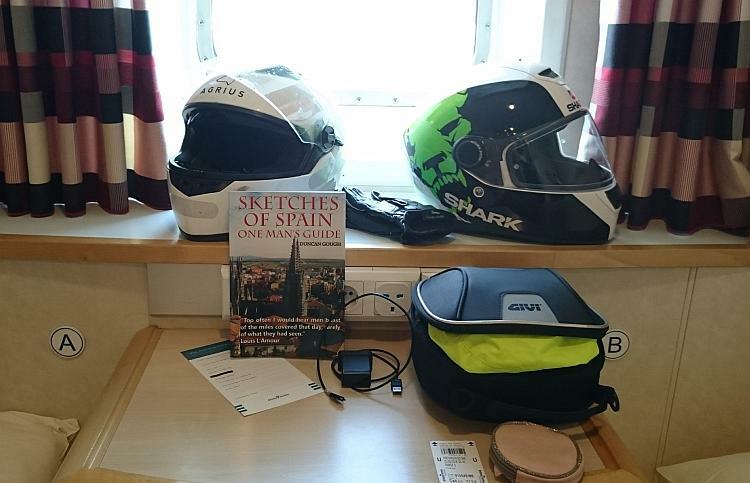 The crew strap down the bike and having already prepared my ferry bag I just take than from my luggage along with my tank bag and I am good to go to our cabin. I am already having fun - l love ferry cabins. They are clean and comfortable and compared to being in a tent for me a cabin is the height of luxury. We even have an outside cabin with a window for our outbound trip, we're so posh. I suddenly remember I have not yet taken my seasickness tablets. I take them now and hope I have not left it too late. They worked fantastically last time I used them, I was pleasantly surprised how effective they were. I read once and I quote from Sunbathing in the Rain by Gwyneth Lewis "Seasickness, by the way, is the nearest external equivalent I know to depression. You feel nauseous, disorientated and you couldn't care less about anything" Having suffered both I always thought this a most accurate description. Fortunately the seasickness tablets do the trick and I feel fine. Ren however is bored. Poor Ren. Me? I'm happy, I'm excited, I'm on route to Spain... Wahooo. 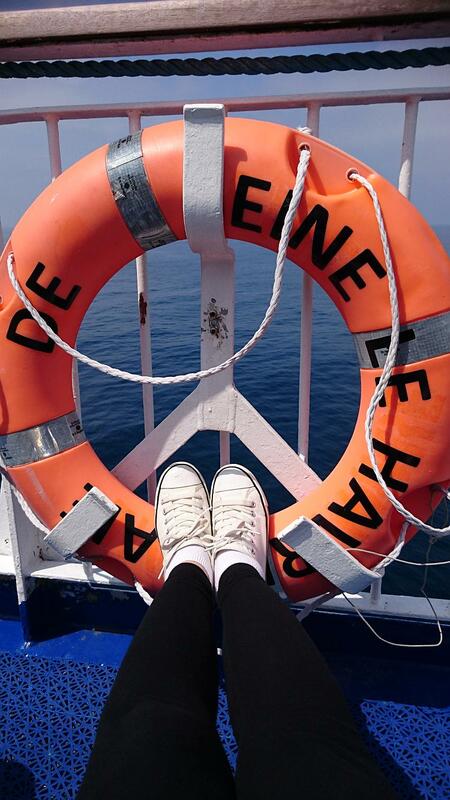 We are off upon the ocean blue.